The key to unlocking the potential of Industry 4.0 is fully harnessing information from connected assets to drive decision-making, a process known as the physical-digital-physical (PDP) loop. Industrial networking infrastructure and technologies reside at the IP layer and below, and enable industrial assets, such as machines, sites and environments, to connect to the business professionals supporting applications across a wide range of industry sectors. 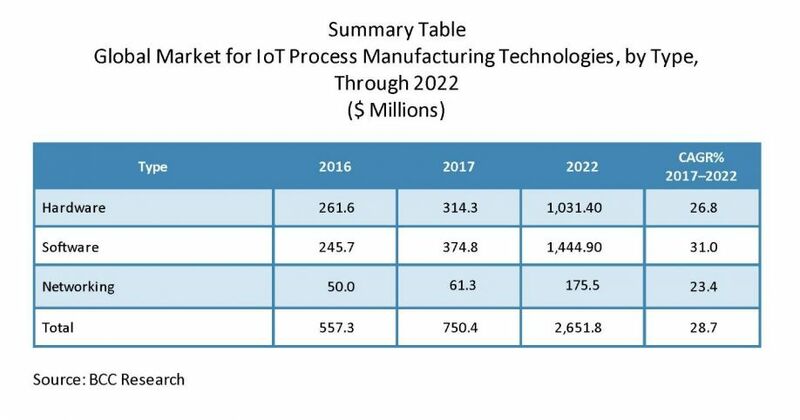 New digital manufacturing survey, completed by nearly 400 C-level manufacturers, reveals 10 trends changing the Industry IoT landscape and building the digital factory. The global Industry 4.0 market is expected to reach $214 by 2023, surpassing the Cybersecurity market by 30%, according to leading research firm Industry 4.0 Market Research. The report examines the technology by software, hardware and networking elements, all of which comprise the IoT system. Software is forecast as the fastest growing market (31.0% CAGR) over the next five years; although hardware currently has the largest installed base. The United States, the world's second largest manufacturer, with a 2017 industrial output reaching a record level of $2.2 trillion, will apply Industry 4.0 technologies to replace China as the world's largest manufacturer. Can US Boost Manufacturing 25% By 2025? Industry Week: A new McKinsey report predicts that manufacturing GDP would climb to $3 trillion in real terms by 2025-a boost of some $530 billion, or 20%, above the current trend.